Greetings! With a few other FX-Men already sharing their discretionary swing trading (Happy Pip and Cyclopip) and mechanical system experiences (Huck and Pip Surfer), I thought I’d do my part to help those jumping into probably one of the most difficult trading methods one can attempt: discretionary day trading. Discretionary day trading can be a challenge because you mix together the two main disciplines of determining entry/exit points and direction (technical and fundamental analysis), and you have to keep up with the dynamic shifts in both daily. It is my hope that my reviews will help those interested in this style of trading to internalize market behavioral tendencies by reviewing economic themes and events daily against a basic technical framework of horizontal lines, Fibonacci retracements, candlestick patterns, etc. If applicable, I will also describe how a simple trade management technique called “scaling in” could have been employed into the trades to maximize a trade’s potential reward-to-risk profile. Horizontal lines (aka “areas of interest” or “inflection areas”): I feel these levels have the potential to draw the attention of traders and attract the most market/limit orders on the day. These areas of interest could possibly affect market direction and momentum. Week Open Price (WO): The currency pair’s opening exchange rate on Sunday, 4pm ET (regardless of day light savings). Weekly Average True Range High and Low (WATR): The top and bottom levels of the average weekly range of movement. These levels are calculated using the 20 period Average True Range indicator on the weekly chart. This volatility number is then divided by 2 and added/subtracted to the week’s open price. I feel these areas can attract orders from range/reversion-to-mean style traders. Daily Average True Range High and Low (DATR): The top and bottom levels of the average daily range of movement. These levels are calculated using the 20 period Average True Range indicator on the daily chart. This volatility number is then divided by 2 and added/subtracted to the day’s open price. I feel these areas can attract orders from range/reversion-to-mean style traders. Major (’00) and Minor (’50) Psychologically Significant Levels (MaPs and MiPs): Price levels ending in ’00 or ’50 tend to attract large institutional orders, thus potentially affecting market direction and momentum. Asian session High and Low: The probability is low, but the top and bottom of the Asian session has the ability to attract attention or orders, so it’s a good idea to watch those levels. Also, they are good markers to set orders for a breakout trade if the Asia session range is tight and volatility spikes at the London session open. One tendency I have observed over time is that Weekly price levels tend to influence price action more than Daily levels. Also previous High and Low levels tend to be stronger than ATR calculated levels. Reversal Signal using Stochastics: When the Stochastic indicator (14,3,3) indicates potential extreme Overbought (+80)/Oversold(-20) conditions. The stochastic indicator is not always used depending on the current market environment (trending vs. ranging). Divergence: When the stochastic indicator and price action diverge in movement. Please visit our Divergence Trading lesson for more info. Fibonacci Retracements: Used during trends to find potential reversal points to get in the overall move at a better price. Reversal candlestick patterns: bullish/bearish engulfing, doji’s, hammers, morning/evening stars, three inside up/down, etc. Using the above technical framework, as well as taking into account the market environment and the potential influence of data releases and news events, I will search for, and breakdown, missed trade opportunities like breakouts (strong candles, news events, or sentiment change), a break and retest, intraday trends and retracement, and reversals, etc. at the end of the US trading session (4 pm ET). To show you what how well the markets could possible react to these levels, check out my example chart below. 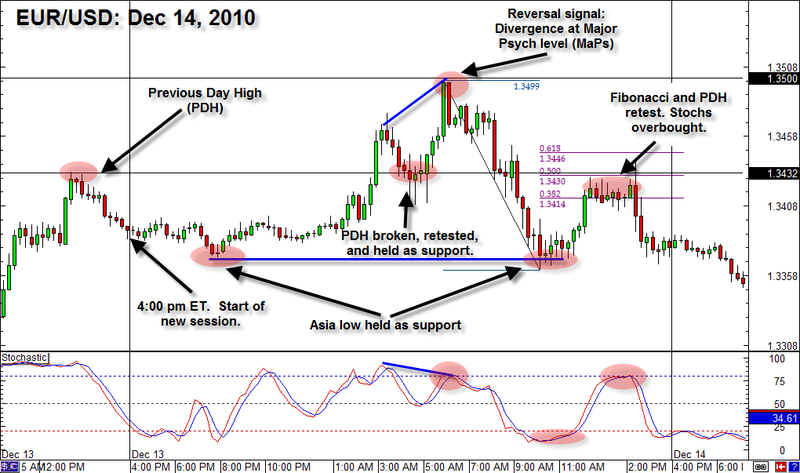 On December 14, 2010, EUR/USD reacted well to a few areas of interest and trade signals. First, there was the break and retest of the Previous Day High (PDH) at 1.3432. Once broken, it served well as support when it was retested an hour later and the market rallied from there to just under 1.3500 for around 70 pips. Next, there was a divergence in price action vs. the stochastic indicator which served as a potential reversal signal just under the Major Psychological (MaPs) level of 1.35. That combination did mark the next resistance area and the market dropped to its stopping point right at the Asia session low around 1.3360–around a 140 pip move or a roughly 1% change. Finally, the market bounced higher about 80 pips and retraced 50% of that strong move down. This was enough for sellers to start jumping in, holding the rally, and reversing the market back down for another 80 pip move on the day. In this example, we can see how the markets take notice and react to these levels and signals, as well as how they can be used as points of reference for simple breakout or support/resistance plays. HECK NO. Let me repeat that again…HECK NO! The markets will not always react to our usual inflection points (or areas of interest) because of any infinite number of variables ranging from volatility spikes on a set of surprise data points to a “fat-fingered trader” mashing the wrong buttons by accident can invalidate those levels in a flash. Always remember that anything can and WILL happen in the markets. But traders do take notice of these areas often enough where this framework does give you a better chance of making better entry and exit decisions. And with daily deliberate practice, we can develop consistency and confidence in using this framework over time. That’s the gist…Time to do work! Well, that’s my new day trading framework and as you may have noticed, these patterns/signals have to be caught in real-time while watching the markets. Trade management tends to be under-emphasized during a traders development, so be sure to check out that lesson if you feel you are lacking in your skills to minimize risk and maximize rewards. If you have any questions, comments, or suggestions for my new framework, please don’t hesitate to hit me up in the comment box below. Good luck!